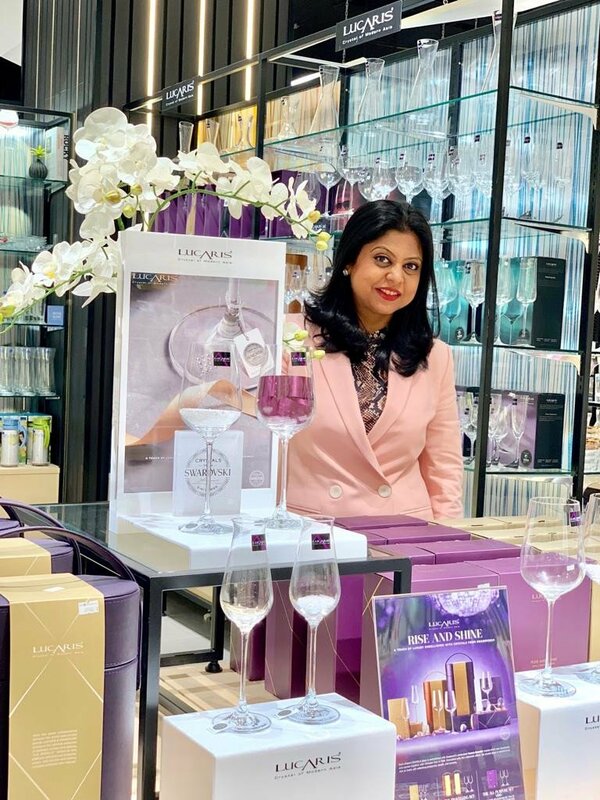 Luxury crystal glassware brand, Lucaris, announced Sonal Holland, India’s only Master of Wine and the country’s most qualified beverage professional as their brand ambassador in India. This marks the Luxury Crystal Glassware brand’s affinity to the Indian consumer and the introduction of unique designs of crystal glassware collections. Master of Wine (MW) Sonal Holland, is India’s most accomplished wine professional and the first Indian to have been bestowed with this prestigious global title MW, from the Institute of Masters of Wine (UK). She has won numerous awards in her incredible journey to become the only Master of Wine in a nation of over one billion people. The shape and size of the glass has a tremendous impact on the sensorial expression and the taste of wine. It is not just something that you use to drink out of, but it is an important wine accessory that has the ability to transform and unlock the wine’s true potential. The size of the bowl allows the wine to swirl and open up, the diameter of the rim decides where the wine lands on your palate and the stem is meant for holding and drinking the wine at the correct service temperature. All these functional aspects are compromised when people choose poorly designed glasses to drink wine out of. I enjoy drinking wine in crystalware. Crystal offers a seamless and an enhanced wine drinking experience compared to ordinary glass, as they are thinner, clearer with a shinier refractive surface. I also choose bowls that are wide enough for the wine to decant in the glass and a narrow rim that lead the delicious fruit flavors straight to the tip of the palate. My association with Lucaris crystalware as their brand ambassador for India primarily stems from our joint passion and purpose, which is to encourage the growing set of discerning Indians and Asians to elevate their lifestyle around wine by adopting the use of better-quality glassware. It is thrilling to be associated with Lucaris at a time when we are witnessing trends in borderless consumerism in India, where aspiring consumers seek products of intrinsic high quality driven by authenticity and innovation, with broad-minded enthusiasm for near-to-home creations. Lucaris collections of crystalware combine aesthetics, technical excellence and an element of aspirational living, all in one, which is a hard-to-find combination in other glassware brands available in the country. I came away deeply impressed from my recent visit to the Lucaris manufacturing facility in Thailand, where they follow stringent quality control processes in order to ensure a fault-free design and functionality in their glassware. I always say the best wine is the one which gets poured in a glass and finishes on a happy note. There is no substitute to one’s own palate in guiding us with which wines we truly enjoy. Our favourite wines are meant to change from time to time as we discover new styles and wine-producing appellations from around the world. I make my own ‘favourite’ wines every time I travel to a wine-producing region, visiting several producers and understanding the passion and philosophy that drives them to create various wine styles. However, my all-time favorite go-to-wines are Champagne, Burgundian whites, Super-Tuscans and Southern Italian reds (particularly those from Campania, Basilicata and Puglia) and a high quality well-aged Sherry. 3) Patience, practice and not let palate fatigue over-ride your judgement, especially when you are judging several wines in a single day. In a country of over one billion people, with nearly half a billion above the legal drinking age, less than 5 million people consume wine, placing India among the lowest per capita consumption in the world. The opportunity available to us is mind boggling. For the urban Indian, wine is a cultural disruptor. Wine has sparked conversations beyond what we could have ever imagined. It is perceived as a ‘family drink,’ a sophisticated, socially acceptable beverage. An equal number of women are purchasing wine as men. The female wine drinker in India is on par with her male counterpart, on consumption frequency, propensity to spend on a bottle and attitudes towards wine drinking. Indian wine drinkers find vino ideal for romantic occasions. A glass of the tipple helps people relax. Wine is perceived to be healthier than other alcoholic beverages. Wine occupies a definitive place in a young millennial’s overall drinking repertoire. They are keen to try new and different styles of wines on a regular basis. Despite limited knowledge, they are consuming wine most frequently with highest average spends on a bottle of wine, among all segments in the Indian market. They view wine as a classy and sophisticated beverage. The taste of wine and its comparatively lower intoxicating levels of alcohol when pegged to other alcoholic beverages, shall motivate the young Indian millennial to swirl, niff and sip wine in years to come. The biggest barrier to wine consumption among consumers isn’t price as is generally predicted. Rather, it is the difficulty in finding wine of their choice at the local retailer as well as the perceived lack of knowledge of the shop or restaurant staff. Indian consumer is thirsty for wine knowledge. Lack of knowledge and adequate availability of wine of his choice leads him to purchase based on familiarity of brands, making brand power the single largest determinant of success in the marketplace. With a bank of knowledge surrounding this domain expert, Sonal Holland can surely be called a true 'oenophile'.